From your dog’s perspective, Christmas is a time of the year when lots of unusual and exciting things are brought into your home, making it a very tempting time for them to get up to all sorts of mischief. 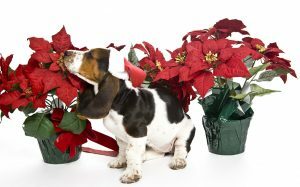 Interesting foods, unusual plants and trees, attractive decorations and Christmas presents will all be of great interest to your dog, but some of these things may be harmful if eaten. The list below may appear like a long list of things for your dog to avoid, but it is important to remember that they are not human, and that some human foods can be very dangerous to dogs. If you wish to give your dog a treat this Christmas, please ensure that it is something dog-friendly and avoid giving them the foods listed below. Chocolate contains a chemical called theobromine, which is poisonous to dogs, as well as other animals such as cats, rodents and rabbits. Generally speaking, the darker and more expensive the chocolate, the more theobromine it contains, and therefore the more poisonous it is. White chocolate contains very little theobromine and so is unlikely to cause chocolate poisoning, but is still very fatty and can still make your dog ill.
Chocolate can initially cause vomiting and diarrhoea, but is a stimulant and so can lead to your dog becoming excitable, as well as developing muscle twitching, tremors, fitting and life threatening problems with their heart. Severe cases can be fatal. Over the Christmas period make sure that all chocolate is out of the reach of your dog, this includes chocolate coins hung from your Christmas tree, advent calendars, boxes of chocolate put out on Christmas day and don’t forget the wrapped chocolaty presents under your Christmas tree (just because its wrapped doesn’t mean your dog can’t smell it!). Although chocolate wrappers are not poisonous, they can cause an obstruction in the gut if eaten. This can be very dangerous and may require surgical intervention. Signs of an obstruction may include vomiting, lethargy, your dog being off their food, not defecating or finding it difficult to defecate. Grapes, raisins, currants and sultanas are all toxic to dogs and it is believed the dried forms of these fruits are more toxic than grapes. It is not known why these fruits are toxic to dogs, or how much is poisonous. Some dogs have eaten large quantities of this fruit and had no effects, while others have become unwell after very small amounts. At this time of year, it is therefore important that all foods that contain these fruits be kept away from your dog; these include Christmas cake, Christmas pudding, fruit cake, mince pies, stollen and especially chocolate covered raisins. As well as possibly causing vomiting and diarrhoea, these fruits can cause kidney failure, which can sometime be delayed for 24 to 72 hours. Kidney failure may sometimes present as a decrease in urination, your dog may also appear dull, or show signs of increased thirst. Prompt treatment is important. If your dog does eat any amount contact your veterinarian immediately. Why these nuts are poisonous to dogs is not known, but macadamia nuts can cause your dog to appear weak (particularly in their hind limbs), dull, sleepy and they can sometimes appear wobbly on their feet, or they may appear in pain or stiff when walking. Vomiting, tremors, lethargy and an increased body temperature can also occur. These effects usually appear within 12 hours and may last up to two days. Some macadamia nuts are covered in chocolate and so pose a double risk to dogs. Roquefort and other blue cheeses contain a substance called roquefortine C, which is a substance produced by the fungus used to produce these cheeses. Dogs appear sensitive to this substance and in more extreme cases can cause dogs to quickly develop muscle tremors and seizures, which may last for up to two days. Dogs are believed to be more sensitive to ethanol than humans and so drinking even a small amount of alcohol can cause effects. Certain alcoholic drinks may be more appealing to dogs, such as cream or egg based drinks. Dogs may develop similar effects to those expected in humans, including becoming drowsy, wobbly on their feet and in more severe cases they can develop low body temperature, low blood sugar, seizures and coma. When cooked, all bones become brittle and can easily splinter. Eating chicken, turkey or goose carcasses may cause larger pieces of bone to cause an obstruction, while smaller pieces may irritate the gut, or even penetrate the stomach or intestinal wall, which may require surgery. When preparing your Christmas day meal, ensure that any meat is kept on the kitchen surface, or out of reach of your dog. When throwing away a carcass, take it to the outside bin, therefore avoiding any temptation for your dog to raid your kitchen bin during the night. Onions, garlic, leeks, shallots and chives all belong to the Allium family. These plants all contain a substance which can damage red blood cells in dogs and can cause life threatening anaemia. Signs may not present for a few days, but can include your dog vomiting, having diarrhoea or abdominal pain and they may appear sleepy, dull, weak, off their food and sometimes they may have rapid breathing. At Christmas ensure that your dog is kept away from sage and onion stuffing, onion based gravies or any other allium based foods. 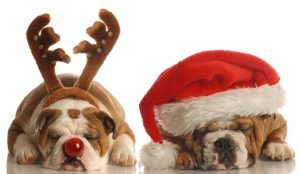 Many Christmas foods are very fatty or rich, and a festive overindulgence by your dog may result in a nasty bout of vomiting and diarrhoea. Large high fat meals can lead to pancreatitis, a very painful and serious condition, which can be costly to treat. It’s easy to overestimate how much food is needed over the Christmas period and some food may be thrown away. Mouldy foods can contain lots of different toxins and, if eaten, may make your dog ill. One particular substance, which is mostly found on mouldy dairy products, bread and nuts, can cause dogs to quickly develop muscle tremors and seizures, which may last for up to two days. If you compost your food scraps, then make sure that they are kept outside in a sealed container that your dog can not access. Poinsettia is often said to be very toxic, but the potency of this plant is often greatly exaggerated. Whilst it may not be as poisonous as you think, it can still cause excessive salivation and sometimes vomiting. This plant is generally considered to be of low toxicity, but the spikey leaves may cause physical damage if eaten, and the berries can cause vomiting and diarrhoea. This festive shrub is considered to be of low toxicity, but the berries may cause a tummy upset if eaten. Some reports suggest that mistletoe is very poisonous, but these refer to American mistletoe (Phoradendron flavescens), which is native to warm temperate and tropical regions of the Americas, rather than European mistletoe (Viscum album), which is native to Europe. This vine may cause a tummy upset if eaten, while substantial or prolonged skin contact can cause severe irritation, or an allergic contact dermatitis. Not to be confused with American poison ivy (Toxicodendron radicans), which is not commonly found in the UK. Potpourri is made up of a number of dried plants and flowers. These fragrant decorations may cause, at the very least, vomiting and diarrhoea. How toxic your potpourri is will depend on which dried plants have been used. Identifying which plants are in your potpourri is often very difficult, especially as the dried plant matter are often artificially coloured. Potpourri often includes harder items, like pine cones or bark, and these could become stuck in your dog’s throat and cause breathing difficulties, or an obstruction in their gut. This can be very dangerous and may require surgical intervention. Signs of an obstruction may include vomiting, lethargy, your dig being off their food, not defecating or finding it difficult to defecate. Most species of Christmas tree are of low toxicity, but oils from the needles may be irritating to the mouth and stomach, causing excessive salivation, vomiting and diarrhoea if chewed. Needles from these trees are sharp and can cause physical injury. Tinsel, ornaments and Christmas tree lights may be enticing to your dog and may appear to be great toys, but they can cause and obstruction, or even gastric rupture if sharp, spikey or easily breakable. Christmas tree lights also may cause an electric shock if chewed. Care should be taken when using antifreeze products, which may contain the chemical ethylene glycol. Ethylene glycol can be lethal when ingested and its sweet taste may make it tempting for dogs. Antifreeze should therefore be stored in secure containers away from pets. If using antifreeze, make sure that your pets are kept well away and if any is spilt, ensure that it is cleaned up. Effects of poisoning may initially appear as vomiting, diarrhoea, weakness and the dog appearing drunk. An untreated poisoned dog may then appear to recover, but this may be followed by kidney failure. Prompt treatment is important. If your dog does drink or lick any amount contact your veterinarian immediately. If a battery is chewed and punctured by your dog it can cause chemical burns, or even heavy metal poisoning in very extreme cases. If swallowed whole, they are less likely to leak their contents, but can still cause a blockage. This can be very dangerous and may require surgical intervention. Signs of an obstruction may include vomiting, lethargy, being off their food, not defecating or finding it difficult to defecate. Button batteries that become stuck in the throat, or in the gut, can produce an electric current which can significantly damage the surrounding tissue. These small sachets are commonly found in the packaging of items such as new shoes, electrical items, handbags etc. Silica gel is non-toxic, but the sachet is often labelled “Do not eat”, not because it is poisonous, but because it is not a food item and therefore should not be eaten. Eating wrapping paper or crepe paper may result in staining in and around the dogs mouth, which may look worrying, but both substances are of low toxicity and so unlikely to be poisonous. During the excitement of Christmas, children’s toys may appear appealing to dogs and parts of toys may be swallowed, causing a potentially dangerous blockage in your dog’s gut. What to do if you are concerned that your dog may have eaten something that they shouldn’t have? If your dog ingests a foreign object, you should take him/her to the vet. You can call us on 01727 226475 during the normal working hours or call our 24/7 out of hours service on 01707 666399.